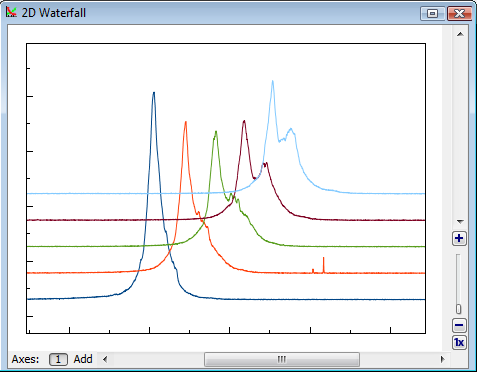 MagicPlot allows you to set individual x and y shifts for every Curve on Figure. This feature may be used to compare several similar Curves on one Figure. Specified Curve shifts do not affect your data and are used only for drawing current Figure. Curve shifts can be set in X Shift and Y Shift columns in Axes Components table (scroll table right if these columns are not visible). 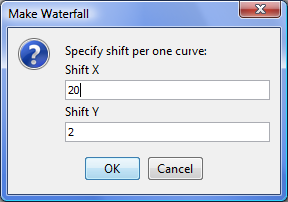 Waterfall menu contains items for making and resetting 2D waterfall and reversing curves order. Make Waterfall menu item opens waterfall window in which you can specify shift increment. MagicPlot tries to guess handsome shift values on the basis of number of curves and current scale.